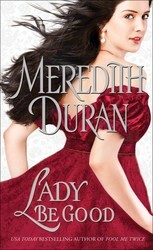 Historical romance author Meredith Duran dishes on her ideal hero–and he’s not who you might think… Keep reading to find out and pick up or download a copy of LADY BE GOOD, Meredith’s newest novel and latest installment in her Rules for the Reckless series, out today from Pocket Books! As a reader as well as a writer, I’ve got a taste for twisted heroes—men with dark pasts, scarred hearts, and wicked intentions. In my own books, it’s the heroine who usually leads by virtuous example. As part and parcel of falling in love with her, the hero comes to hold himself to a higher standard—thereby making himself worthy of her respect and love. That said, when it came time to write my next historical, LADY BE GOOD, I found myself dreaming of a different kind of guy—not the black sheep, but the golden boy. You’ve probably met a few golden boys in real life. In junior high, he was the beloved class clown whose jokes made everyone laugh, but never at anyone’s particular expense. In high school, he was the star quarterback, the dreamboat, who visited his grandmother every afternoon after football practice. He knew the names of each of his classmates, and had a good word to say about all of them. The golden boy is an easygoing, sweet-tempered charmer. His life seems touched by magic; no wonder he’s in a sunny mood all the time! His attitude rubs off, too. It’s impossible not to smile when he’s around. That said—what happens when the golden boy’s luck runs out? That was the question that moved me to write LADY BE GOOD. Christian Stratton, Viscount Palmer, is our quintessential golden boy: handsome, dashing, a celebrated war hero, famously charming and well-liked. But when Christian finds himself mired in a dangerous nightmare from which charm, decency, and good intentions cannot save him, he has no choice but to find an ally better acquainted with wickedness: Lilah Marshall, a reformed thief masquerading as a respectable young lady. Lilah takes no pride in her criminal skills. She desperately wants to be virtuous. She covets the golden life that Christian seems so effortlessly to inhabit. But it’s not her virtue that Christian requires. After all, golden boys don’t know how to be villainous. Christian needs Lilah to teach him—whether she wants to or no. It turns out, my ‘golden boy’ takes to villainy quite well. Christian has a dark, gritty strength at the center of him—and an undiscovered wealth of wicked intentions, most of them centering on Lilah. Tracking Christian’s journey from sunny idealism to fierce, wicked intensity was a great deal of fun. I hope readers enjoy it as much as I—and Lilah—did!